Audio network player is a new style of audio. By using network player, you can enjoy sound sources stored on a NAS (Network Attached Storage) or a PC, using a tablet device as a remote control, just like a Juke Box. You can easily search tracks by genre, artist name, etc. You can also enjoy viewing album art on the screen of your tablet device. You can check a track title, an album name, and an artist name on your tablet’s screen and on the display of the network player as well. Network player is truly the next-generation of audio, with high sound quality, high reliability and easy operation. 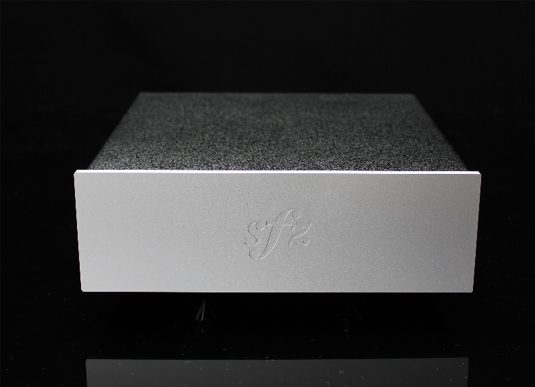 The SFORZATO network player plays not only high-resolution PCM, but also DSD. It plays all high quality sources with outstanding sound quality. All you do is choose the tracks on your tablet. After that, just sit back and enjoy. DSP-030EX feature a clock generator (TCXO) with outstanding low phase noise (120dBc/Hz @ 10Hz). If you wish to enjoy still further fidelity, the units come equipped with a 10MHz master clock input. DSP-030EX features an external power enclosure, completely shutting out noise and vibrations from the transformers. Designed to efficiently disperse vibration, spiked feet right under the toroidal transformers supports the enclosure. Using a eight-layer circuit board with a wide top/bottom grand plane allows the majority of digital signals to be arrayed within the mid-layers. Heavy shielding reduces noise to the utmost. Non-magnetic noise absorbing sheets and shield casing cover noise generating components like the CPU, which provides network connectivity, and the clock circuit area, achieving robust noise suppression. The digital controller is driven by an ARM11 microcomputer and FPGA. Network-based software updates allow your device to always enjoy the latest features and functionality – this means our products continue to evolve even after you’ve purchased them.